Cut 4 pieces the same size. Use a brush to put one layer of Paverpol onto the skeleton. Wrap it as tight as possible. Put a layer of Paverpol onto the piece of Wrapper. When dry you can put a layer of Paverplast Paste on top of it. This is a mixture of Paverpol and Paverplast powder. This way you can make a skeleton which is firm and smooth. 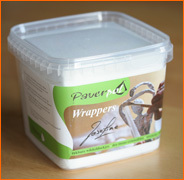 Wrappers can also be used to decorate Paverpol statues. Perfect to use for hats and shawls. Dip the Wrapper into the Paverpol, squeeze it and put it onto the sculpture. Be careful because you can easily tear it! Even art pieces like paintings, panels, photo frames, boxes, etc., can be decorated by using Wrappers.